Parenting a small child is a pretty constant cycle of sameness. For us the cycle involves two (or three) naps a day, an activity out of the house each morning, chores and chilling out in the afternoon, dinner and bedtime. That cycle can seem fairly relentless some days. But when I stop, notice, and enjoy the moments within the cycle, it is so easy to find the joy. – Big giggles for me saying “cricket” when New Zealand won the World Cup semifinal. – Babies sitting in a circle and grabbing toys off each other at playgroup. – A very serious conversation with a stick of capsicum at dinner time (made more hilarious by the globs of hummus on her face). – Lots of long sleepy feeds as we get used to a new nap routine. – Grabbing a wrench and “helping” her Papa install the new gate for her bedroom door. – A giggly nudie run after we came in from the paddling pool. – Discovering that her voice sounds funny when she talks into a cup. 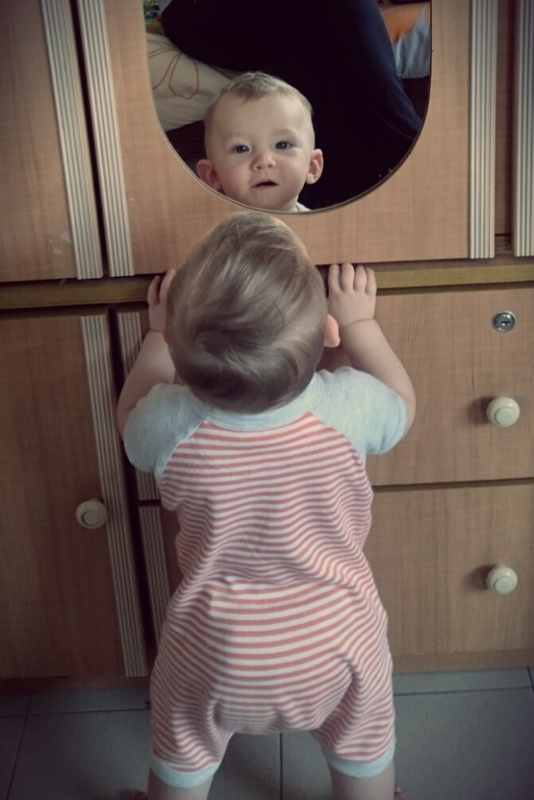 – Finding the baby in the mirror all by herself. I don’t suppose these things are as hilarious or amazing to someone who is not this baby’s parent. But all of them made me smile the first time, and made me smile again when writing them down. So I hope that even if the specific moments don’t translate well, the joy in this list is evident. Because there really is so much joy.